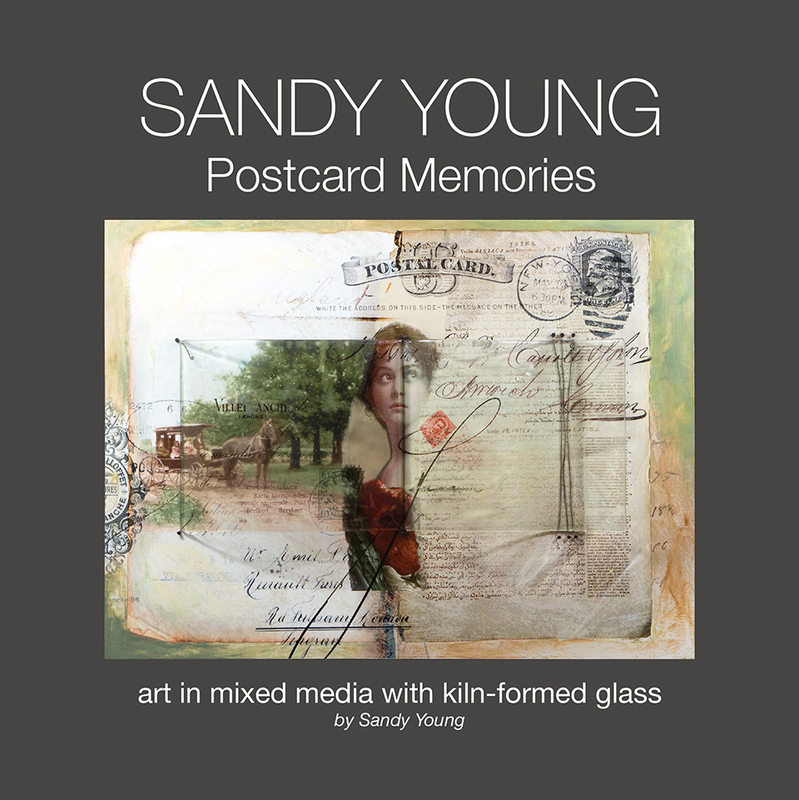 Just Released: SANDY YOUNG: Postcard Memories! 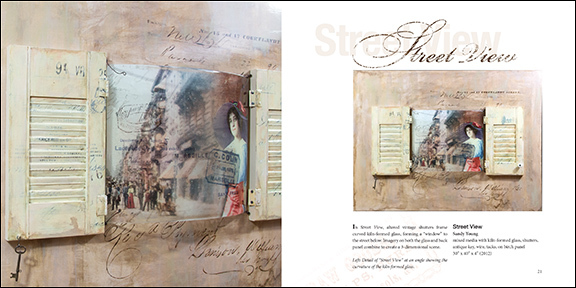 A new art book covering a selection of 26 mixed media art pieces within the theme of “Postcard Memories” by Sandy Young . I’ve received multiple requests for a book or portfolio of my mixed media art. I decided to start with a small coffee table picture book showcasing a selection of my art focused loosely around the theme of one of my pieces “Postcard Memories”. 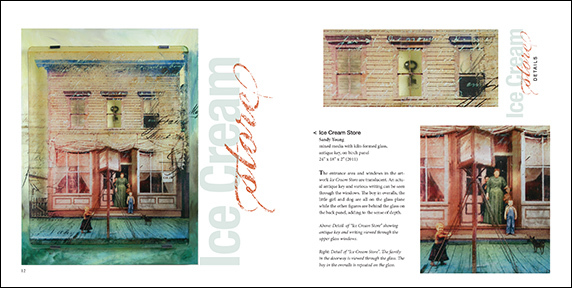 In this book I include 26 pieces of art with over 40 color photos, along with brief copy describing the selections. Price: $ 24.95 FREE shipping, + I’ll cover the sales tax. Note on checkout: A Paypal account is not required. Choose credit card checkout on the second screen. Award-winning contemporary artist Sandy Young presents 26 of her unique works of art in this beautiful artist-designed book. The works presented reflect 19th century and early 20th century imagery and concepts of time, worked into mixed-media compositions with kiln-formed glass overlay. 47 photographs document the artworks selected by the artist to reflect the theme “Postcard Memories”. This compact tabletop artist monograph is artfully designed with photos, graphic embellishments and artwork details on every page. 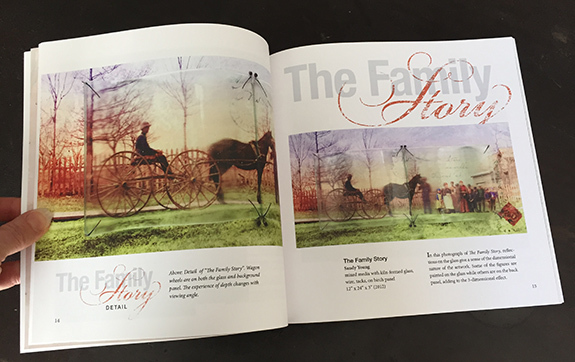 Included is an artist statement and brief descriptions of the artworks inspired by turn-of-the-century handwriting, photographs and show posters. Artist Sandy Young uses innovative techniques to create dimensional wall-hung artworks that can only be conveyed with the help of photos taken at angles to reveal dimension and form. Curved and raised fused glass surfaces formed with imagery overlay and interact with painting and imagery on a base panel to create a sense of depth. Close-up detail photos show wire, tacks, painting, montage, image-transfer, antique skeleton keys and fused glass pieces with kiln-formed bubbles. 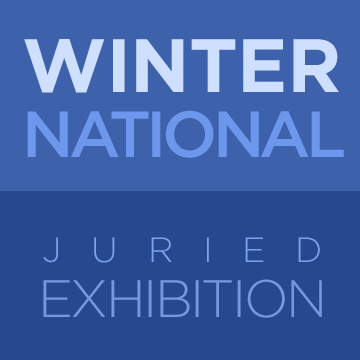 Artwork imagery includes 1800’s and early 1900’s show posters, dancers, circus performers, western towns, horse and buggy, stamps, handwriting, postmark cancellations, correspondence, books, buildings and sewing. Despite the antique and vintage imagery, the artist brings a contemporary flair to her one-of-a-kind artworks. Young emphasizes the intangible aspects of the work that she describes as a “…metaphor for the multi-dimensional nature of individual life experience”. Conceptual themes include time passage, the juxtaposing of old with new, life stories, and the representation of psychological and internal experiences through layers of markings and fragmented images. This creative artist monograph with the artist’s own touches is inspiration for artists and collectors alike. Readers will be delighted to discover this visual reference to Sandy Young’s complex work. Sandy Young is a contemporary award-winning artist whose work spans multiple artistic disciplines, from mixed media, glass, painting and printmaking to short-form motion art videos and installation. 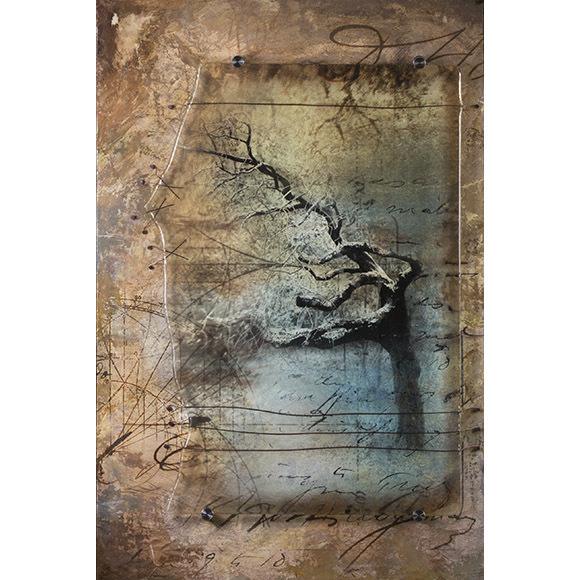 Ever innovating, she has developed her own proprietary methods for creating imagery in glass and has received multiple awards for her art. Her dedication to artistic expression follows a successful career as a Photo-illustrator for clients such as TIME Magazine, Simon & Schuster, Random House, Forbes, TIME Global and a multitude of other publications.